So, I sold this ban era SLR 95 to a friend of mine bout 10 yrs ago, he never fired it and ive been on his case to get it back. I got it back bout 45 days ago and I decided to return it to all its original, intended glory. 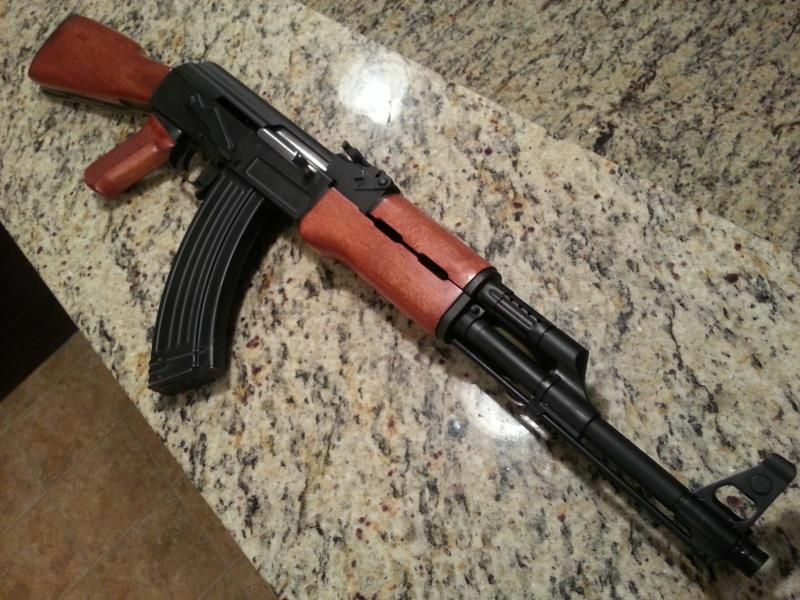 I own and have owned ALOT of AKs, and 74s even tho im an AR guy and ill tell ya, Bulgarians make the nicest AKs around. 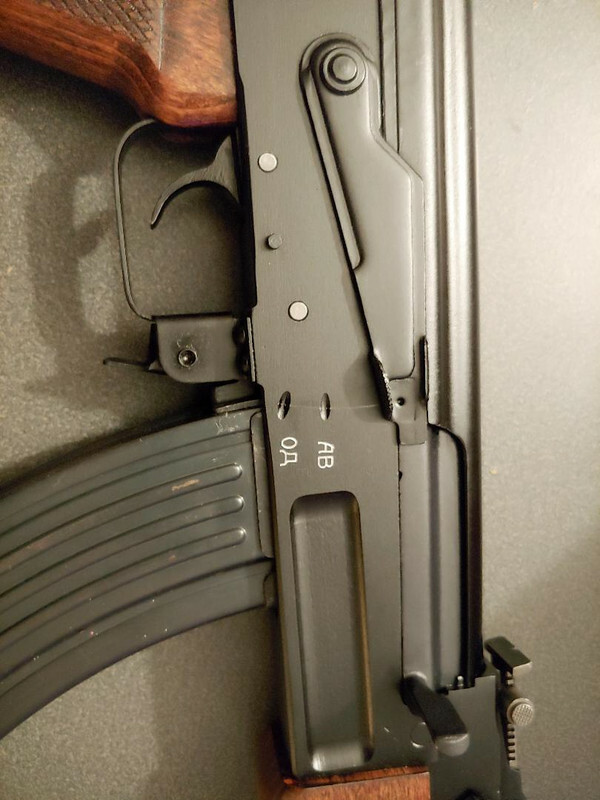 luckily im friends with one of the best AK/Krink builders in the country and hes local. I decided to replace the thin barrel with a heavy Bulgy bbl, 45 deg gas block, milled front sight post, muzzle nut, Russian black finish, proper Bulgy selector stops/markings, lower tang and a few other parts, to include a beautiful milled, stock set. We got all that done, head spaced and test fired and it shoots like a dream!! pic one is the ban era profile and the rest of the pics are of it in all its glory! Very nice. My son was mentioning the idea of a Bulgarian AK. One is somewhat on our radar screen. Very nice, I had a 95 once too ... it was on my list of regrets and found another one last year. I really like your wood but I went the other way because I wanted a folder so I went with the MagPul Zhukov furniture and a Texas Weapons Systems Dog Leg top cover with a picitinny rail so I can have a scope, red-dot or a peep sight. I sorta tried to get the compensator off, but I didn't try very hard ... it doesn't bother me now like it did back then but I wouldn't mind not having it there. Now that is what I think of when I think "AK47". 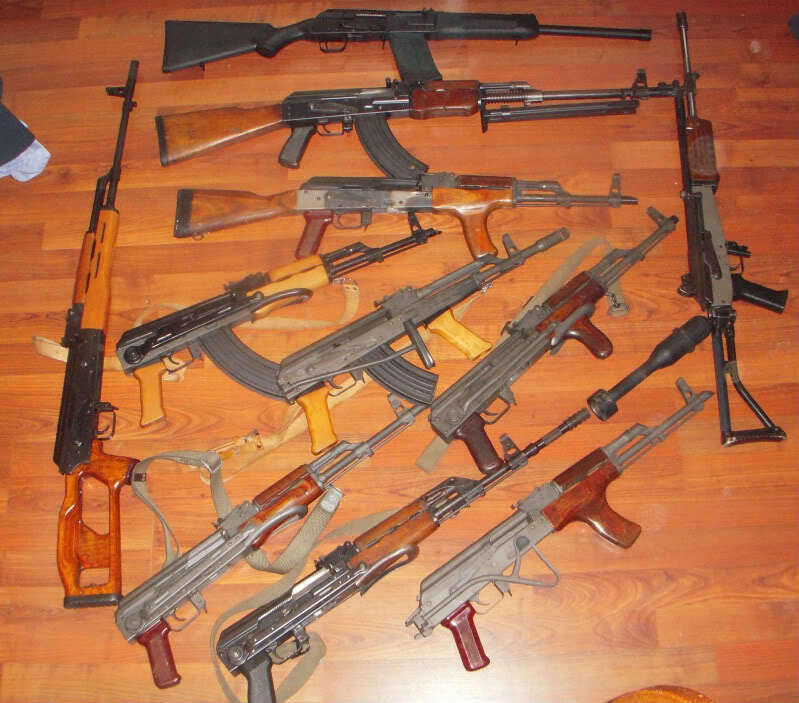 I still have one lone AK-74. The ten crates of 7n6 ammo in my garage helps with keeping it too. 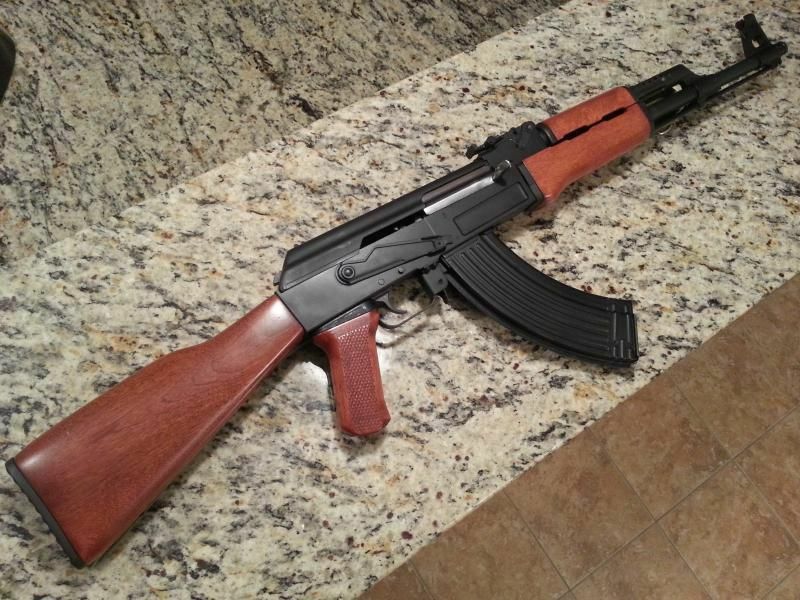 I'm a compulsive pimptasticizer when it comes to AKs, but there's nothing like the classic look. FWIW, I keep an unmolested OPAP on hand to salve my conscience and give myself the pimp hand I occasionally deserve. That turned out well! I have an SLR95 that needs a facelift. They are the best operating AK variant I have handled. 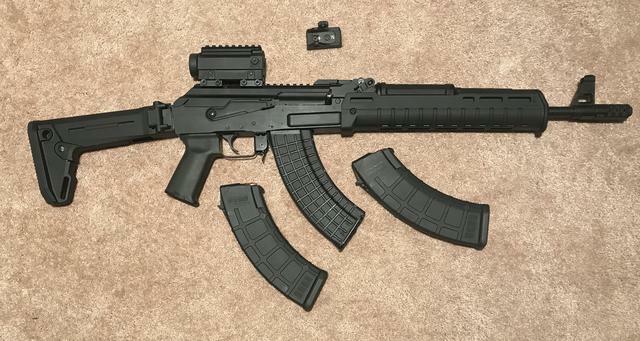 I always thought the Bulgarian SLR 95 were one of the best made AK out there. They were advertised being made with a with a Steyr hammer forged chrome lined barrel way back when. LGS bought 2 cases of these when they came out and was selling them for $327. Looking it over and reading the advertising literature that was in the case. I knew it was a score at $327. After the 1st case sold out very fast, price went up about a $100. Still have mine wished I had bought a few of them..LOL. The thumbhole stock might not look right on an AK but I've found it is kind of comfortable to shoot. yeah, they can be addictive. I hate to admit it, but this isn't all of mine. thanks everyone..i wanted to create a type III clone to some degree....im a traditionalist on most things and wanted the classic, non optic look. and you cannot beat a Bulgarian...I like them better than the Chinese rifles. You clearly have a problem. Not enough distance to get your entire awesome collection into the camera shot. You've got a great selection there! Where'd the furniture come from? Cleaned up surplus? IWD? Nothing as nice as your Bulgy there. Mine is a Polish 1960 milled with IWD furniture that a good friend finished for me. "BFPU", please. "Distressed" is for Mom Jeans. Is that a fun switch or is it cosmetic? I wish it was a real happy switch but its just for appearance purposes...unfortunately. You did an excellent job of imitating the other detent ... its a little different but a fine job just the same!